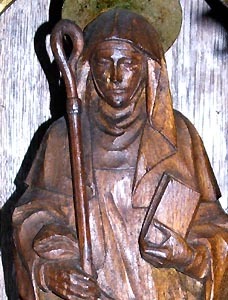 St. Issey was one of the many daughters of King Brychan Brycheiniog who evangelized Northern Cerniw (Cornwall). She lived as a hermitess worshipping in a little chapel which she built at Lower St. Jidgey in Egloscruc (St. Issey) near Padstow. There, she is said to have acted as a judge, settling disputes amongst the locals. Issey was probably a friend of St. Elide of St. Helens (Isles of Scilly) with whom she once shared the dedication at Egloscruc (St. Issey); and of St. Meva of Mevagissey (near St. Austell) whose church they appear to have established together. Issey travelled across the West Country and in Brittany, founding additional churches at Ide (Devon), Plouisy (Cotes d'Armor), Lannidy in Lanneanou and Lannidy in Plouigneau (both Finistere). She died on 20th November and was buried in her chapel at Egloscruc (St. Issey), later being translated to the parish church. Her shrine was a great draw to pilgrims for centuries and one side of it is retained as the reredos behind the high altar. It features portraits of twenty of her siblings along the top edge. St. Issey was identified with the Irish St. Itha, by Rev. Sabine Baring-Gould, upon little, if any evidence. This identification has unfortunately been accepted and adopted by the church at St. Issey and elsewhere in the locality.